Snuff these common summertime pests the natural way—and keep them from coming back—with these tried-and-true methods. Landing on the food at your backyard barbecue. Buzzing around your face as you do yard work. Zipping through your front door as soon as you open it. They are Musca domestica, the common housefly. 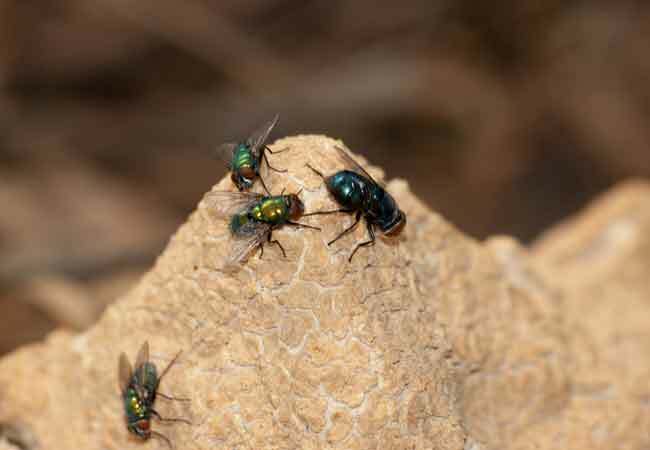 While there are thousands of species of flies, Musca domestica is the variety most likely to bug you both inside and outside of your home, found as they are on every continent inhabited by humans, in climates from the arctic cold to the tropical heat. In North America, houseflies tend to be active from spring through fall, generally reaching peak activity during the summer. 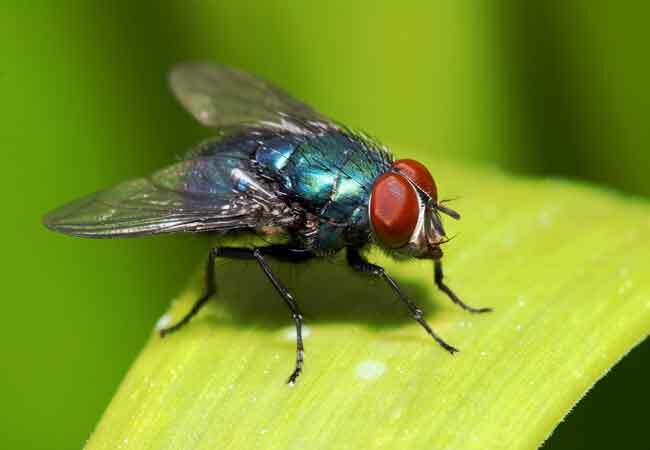 Beyond being a nuisance, flies carry a wide variety of germs (such as the bacteria that cause anthrax, typhoid, stomach ulcers, cholera, dysentery, and tuberculosis, as well as less serious illnesses), which they deposit wherever they land—including that hamburger you’re about to bite into. Worrying about flies also means worrying about maggots, the larval form of the fly. A female housefly generally lays more than 100 eggs after mating, and the eggs hatch astonishingly quickly. Maggots spawn in less than eight hours if the weather is warm enough. Fortunately, you can get rid of the flies that plague your property, and you can do so without using poisons that could put your pets and family at risk. Follow these steps to banish this summertime scourge so you can enjoy the season (largely) fly free. Plug in a fan. These uninvited insects can’t fly well in strong breezes, so set up an oscillating fan on an extension cord near your backyard grill, picnic table, or any other area where you congregate outside. When flies feel the gust, they’ll head in the opposite direction. Make a flytrap. Dissolve ¼ cup of sugar in one cup of water in a jar. Roll a stiff piece of paper into a cone long enough to reach from the top of the jar to just above the level of the liquid, and snip off the tip. Tape the cone inside the jar with the wide end filling the jar’s mouth and the cone’s tip right above the sugar water. This paper cone will funnel curious houseflies right into the jar, making removal a cinch. Light a candle. Citronella, a highly aromatic oil distilled from several varieties of lemongrass, repels both flies and mosquitoes. Light a few of these fragrant candles and set them on your picnic table, porch, or grill area; the strong scent serves as a “not welcome” sign to winged nuisances. Swat them. It’s immediate, effective, and strangely satisfying to swat flies dead. 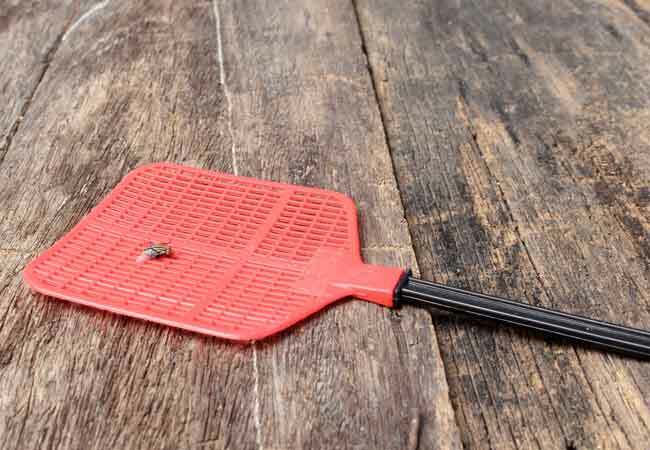 If you’re squeamish about doing the deed with a traditional flyswatter, try an electric one. These devices (most resemble small tennis rackets) electrocute flying bugs with a loud zap. Say vamoose with vodka. Flies hate the smell of this liquor, so fill a few small plastic sandwich bags halfway with the cheap stuff, zip the bags most of the way shut, and then use twine or string and some heavy-duty clothespins to hang the bags around your yard. Sounds crazy, but it really can help. DIY some fly strips. Instead of buying commercial scented fly strips to deter the pests, make your own with the essential oils that flies hate. Simply cut a piece of cloth into strips 12 inches long and one inch wide. Moisten each strip with several drops of any of the following: clove, lavender, lemongrass, citronella, eucalyptus, rosemary or mint. Tie the strips on branches and the railings around your patio, and let the scent of the oil get rid of the flies outside. Keep it clean. Flies love open garbage pails, uncovered compost bins, and dog droppings. So tidy up after outdoor parties and keep a tight lid on trash cans and compost. If the family pooch does his business in the yard, clean up after him immediately. Let spiders have at ‘em. Unless spider webs stretch across an area you’ll walk through or reach into, leave them be. Hungry arachnids will devour any flies they can snare. Plant fly-repelling herbs. Surround your patio or barbecue with the potted herbs that flies hate. That includes basil, lavender, and mint. Watch out for water. Don’t let pools of water sit stagnant around your yard. Flies need to drink water and so are drawn to puddles, birdbaths, and soggy patches caused by dripping sprinklers. Clean fruit birdfeeders. It’s fun to watch backyard birds feeding on fruit, but flies are bound to be unwelcome guests at the party. Toss the rinds as soon as your feathered friends finish their feast. Mow regularly. Flies often lay eggs in long grass, which offers them moisture and protection. Mow your lawn weekly during the peak summer season to stave off an infestation.